In my earlier post on Reviewing Installed SAS 9.2 Software and Hotfixes I mentioned that I ran into a few User Access Control issues on Microsoft Windows Server 2008 R2 when using the SAS ViewRegistry Report utility and the SAS 9.2 Hot Fix Analysis, Download and Deployment Tool (SAS92HFADD). To get the SAS ViewRegistry Report and SAS92HFADD utilities functioning correctly on Windows Server 2008 R2, the User Access Control (UAC) feature will require you to go through a few extra hoops (unless you have it disabled). UAC is a security feature that, when enabled, means that administrators log in and operate as standard users most of the time, and when they need to do something that requires elevated privileges they will be prompted by Windows (or as I also found out sometimes silently blocked). If you want more information (and a fuller explanation of UAC) then read the Microsoft document User Account Control Step-by-Step Guide. If you run your server with UAC disabled then you can just follow the SAS instructions as normal and disregard this particular blog post. Of course running with UAC disabled is not normally recommended. I seriously considered turning it off, but decided I would try to ‘do the right thing’ and also use it as a learning experience. After a bout of UAC frustration I spoke to one of my friends who specializes in Microsoft technologies and he told me he leaves UAC enabled and tends to have an administrative PowerShell window open for when he needs to do some admin things. In this post I’ll explain what I needed to do, in addition to the SAS provided instructions, to get those utilities working on Windows Server 2008 R2 with UAC enabled. 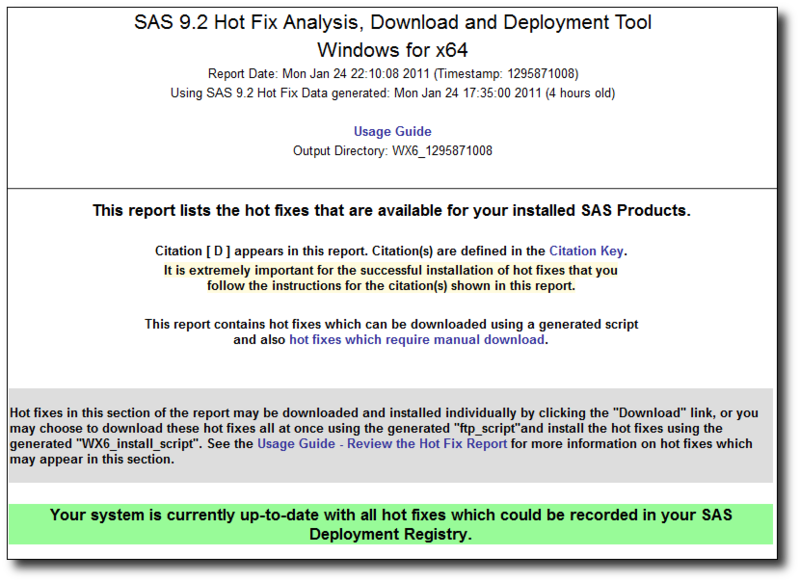 The SAS ViewRegistry Report utility is used to generate HTML and text reports listing the SAS software and hotfixes currently installed. 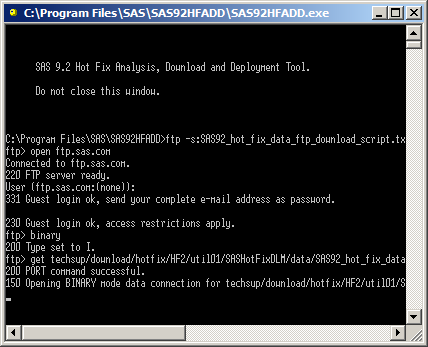 You can also feed the output of this utility into the SAS92HFADD utility to generate another report detailing the appropriate available hotfixes that have yet to be installed, together with scripts to download and install them. This time it worked, generating the DeploymentRegistry.html and DeploymentRegistry.txt files as expected. 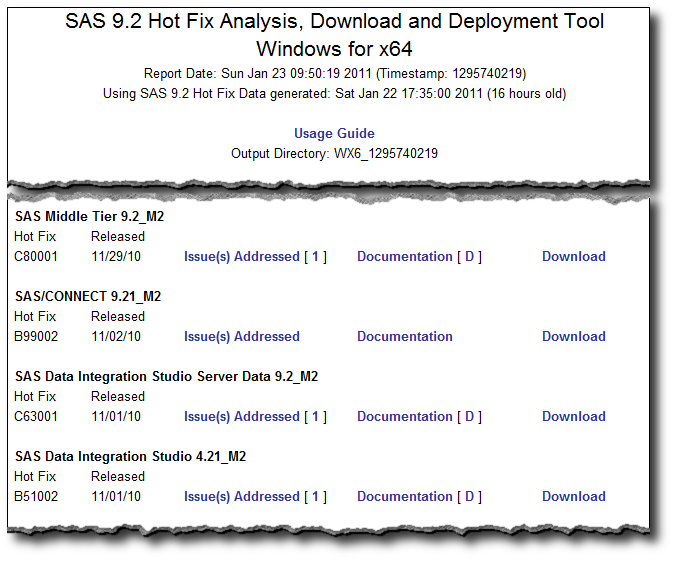 The SAS92HFADD utility takes the output from the ViewRegistry Report utility and generates another report detailing the appropriate available hotfixes that have yet to be installed, together with scripts to download and install them. 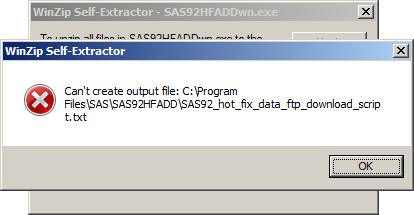 I now had the C:\Program Files\SAS\SAS92HFADD directory and files as expected. Into that directory I then dropped a copy of the DeploymentRegistry.txt file from a run of ViewRegistry Report utility. I actually missed this step the first time around and got the >> %%% ERROR: Unable to open DeploymentRegistry.txt error in the tool_log.txt file as explained in the SAS documentation. The FTP script to download all the hotfixes ran successfully to completion this time. It took a while, as there were many hotfixes to download, but when it finished I had a bunch of hotfix executables in the DeployTools directory. Now it was time to install them. To install the hotfixes I used the automatically generated DeployTools\WX6_install_script.bat script that silently installs each hotfix in turn. I started out running this by just double clicking on it in Windows Explorer. I guessed UAC would most likely block it, but once again I wanted to see how it would fail. It took a little while to complete, and appeared to be doing something without generating any errors, however when it had finished I could see by re-running the ViewRegistry Report utility that nothing had changed – no additional hotfixes had been installed. Once the install script had completed, I went through the analysis report to ensure I did all of the outstanding manual tasks. I found the manual tasks by reading through the several linked documents in the analysis report that were tagged with a [D]. In this case it included upgrading metadata using the SAS Management Console, copying a plugins directory into a couple of locations, using the SAS Deployment Manager to rebuild a number of EAR files, and then redeploying the updated EAR files. With all of this done I did a final check by re-running the ViewRegistry Report utility, copying over the new DeploymentRegistry.txt file, and then re-running SF92HFADD.exe. The resulting analysis report now had a nice green banner indicating that I was up to date with all of the available hotfixes. This process assumes you want to install all of the available hotfixes. If your update strategy is to only install a subset of the hotfixes (such as those with alert notes) you can edit the generated ftp and install scripts to only download and apply those hotfixes you have targeted. The analysis report is a very useful document to help you determine what hotfixes are available for your platform/product mix that haven’t yet been installed. The report can also be used to help you chose which of those hotfixes are appropriate for your update strategy by reviewing the Issue(s) Addressed links. Regarding UAC, at some point I also tried using a Windows Explorer (run as administrator) but found that the things it launched did not themselves run as administrator too. Looking back on it now, it probably would have been easier to avoid Windows Explorer completely and just use the administrative command prompt window (or PowerShell) – as my Microsoft oriented friend later suggested. I guess I could have also temporarily disabled UAC for the duration of this process and then re-enabled it afterwards. Taking this easy way out, however, would have meant I didn’t find out what I could and couldn’t do with UAC enabled, and I would have also missed out on the learning experience. What I originally meant to be a reasonably short post has actually turned out to be much longer than I expected! If you’ve made it to the end and have any comments, or suggestions about alternative approaches, please let me know by leaving a comment below. 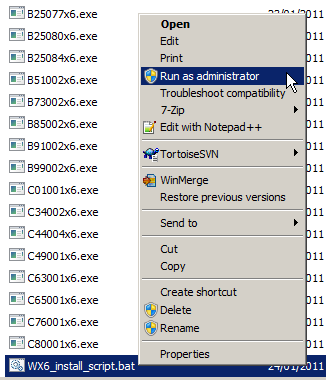 Today I needed to reset the permissions for a bunch of files in a directory on a SAS server (running Windows Server 2008 R2) so that they reverted back to the inherited permissions from the directory they were contained in (they currently had non-inherited explicit permissions for a particular user). There were too many to do by hand using point-and-click in the properties dialog so I switched to the command line. NOTE: Cacls is now deprecated, please use Icacls. The Microsoft TechNet site has documentation for the icacls command. Resetting the permissions on a file drops any specific/custom/explicit permissions on that file and reinstates the inherited permissions from the container/folder so that the file now only has the default inherited permissions. 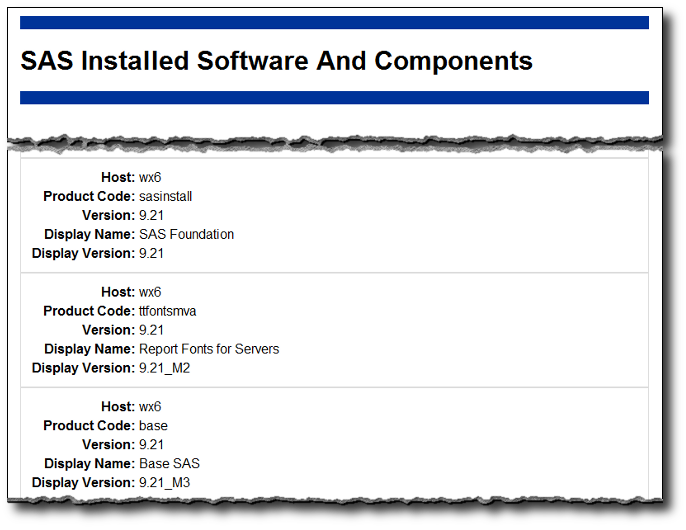 If you’ve ever needed to review which SAS® software components have been installed on your SAS servers and clients, as well as know which hotfixes may have already been installed, then you will be interested in SAS Usage Note 35968: Using the ViewRegistry Report and other methods to determine the SAS® 9.2 software releases and hot fixes that are installed. The usage note provides instructions detailing how you can use a Java-based SAS utility (sas.tools.viewregistry.jar) to generate HTML and text reports (DeploymentRegistry.html and DeploymentRegistry.txt) of the installed software and hotfixes. With SAS 9.1.3 I used to manually maintain (error-prone) spreadsheets with this information, so I am very happy to be able to automate it with SAS 9.2 and get reliable information. One thing that tripped me up when I first tried to run SAS92HFADD (because in my excitement I skimmed over the instructions too quickly), was that you need to manually run ViewRegistry to get a DeploymentRegistry.txt file to drop into the SAS92HFADD directory. It would be great if a future version did this automatically. I’d also be quite keen to see it all managed from a central admin console that reaches out to all the SAS servers and clients in an organization to collect this information and optionally push out selected hotfixes. Perhaps this could be a suggestion for the SASware Ballot? For those who run SAS software on Windows Server 2008 R2, you might run into the same User Access Control issues I did, so I’ll do a follow up post specifically on using ViewRegistry and SAS92HFADD on Windows Server 2008 R2. 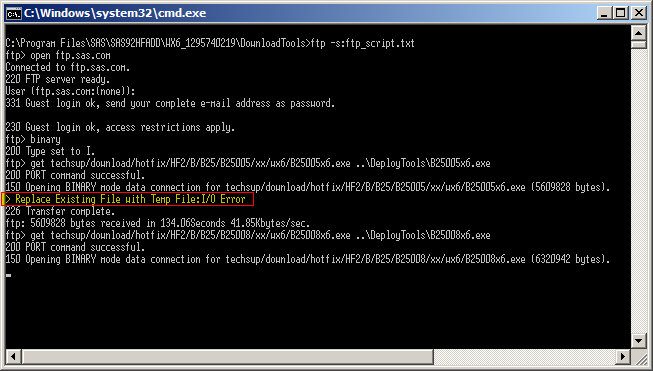 I was trying to run a manual SAS Metadata Server backup (OMABAKUP) on Windows 2008 R2 64 bit today. It failed! I run metadata backups many many times so I was sure all the normal prerequisites were in place but this was the first time I had run one on Windows 2008 R2 64 bit … hmm … I remembered seeing a SAS usage note about metadata backups on Windows 2008 a week or so back. A quick search found SAS Usage Note 38869: What credentials are needed when running a SAS® Metadata Server backup in batch on Windows 2008. It described the error I saw in the SAS log perfectly! The resolution was to Run as administrator. Even though I was logged in to Windows as an Administrator I still had to explicitly run the SAS program in an administrative context (it’s a Windows security thing). As mentioned in the usage note, this is also documented in the SAS® 9.2 Intelligence Platform: System Administration Guide, Second Edition, Chapter 11 Using the %OMABAKUP Macro to Perform Backups and Restores, in the section Ensuring Appropriate User Credentials. So I had a SAS usage note describing the problem and the solution. The trouble was I couldn’t quite get the instructions in the SAS usage note to work for me. When I right click over the Command Prompt window (or a PowerShell window for that matter) I don’t get a Run as administrator item. 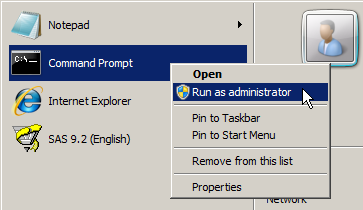 What did work for me though was to right mouse click over the Command Prompt item in the Windows Start Menu, and click the Run as administrator menu item – here’s a quick screenshot to clarify. … a quick check of the SAS log shows everything worked as expected this time. There is an explanation of the meaning of the revision number in SAS Installation Note 35627: Determining your SAS® 9.2 release. SAS 9.2 Revision 10w46 as mentioned in 36616 is more recent (being 2010 week 46) than SAS 9.2 Revision 09w51 mentioned in 40501 (which is 2009 week 51).